A fun holiday on an island resort is everybody’s dream. 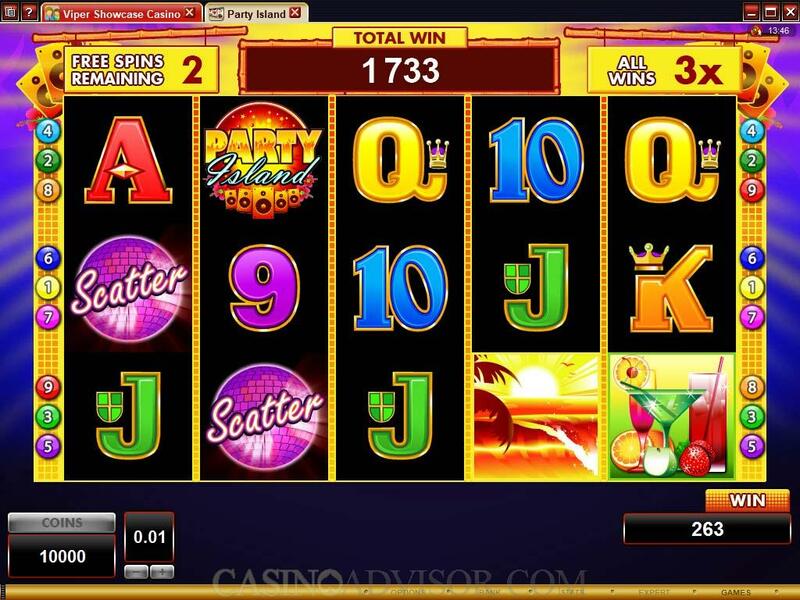 Party Island enables slots players to fulfill this dream from home. Players can party hard at night with symbols like Dance and Record. The Sunrise symbol is breathtaking, though party goers are likely to give it a skip. Day time activities at Party Island include lazing on the beach like the Bikini Girl and sipping Cocktails. High value card symbols from Ace to Nine also appear on the reels. 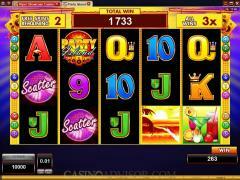 These are colorful and have been crafted in a royal style that has become the trade mark of Microgaming slots. The Party Island Logo is the wild symbol and the Glitter Ball is the scatter symbol. 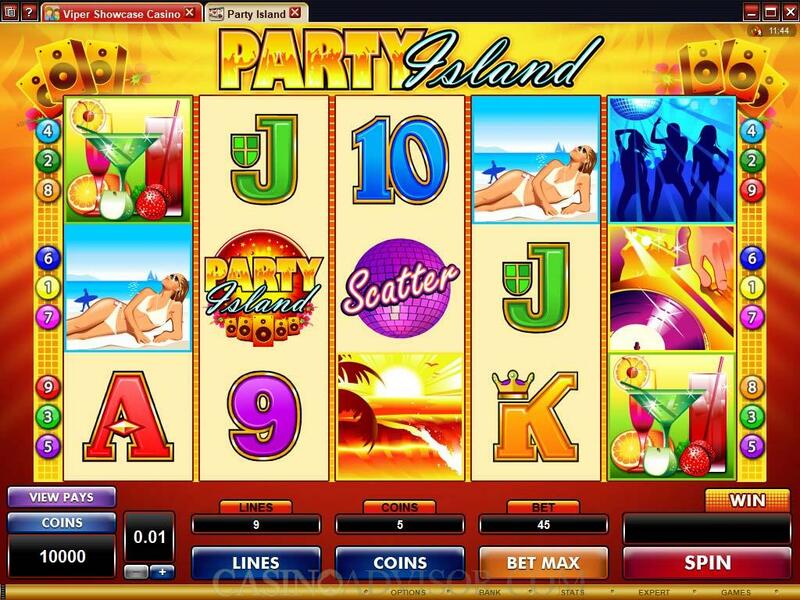 It is surprising that Party Island has only nine paylines and that players can wager at most five coins per payline. This would have restricted the bet size considerably had it not been for the large coin denomination range. The coin size can be varied from 0.01 to 1.00. This allows for a maximum line bet of 5.00 credits and a maximum total bet of 45.00 credits and high rollers have at least something to go on. The Party Island Logo symbol is not only a wild symbol but it also doubles payouts when it assists in making winning combinations. This symbol also offers the highest fixed jackpot payout of 10,000 coins. At the highest coin denomination this translates to 50,000 credits. The next highest jackpot payout is only 1000 coins and this adds volatility to the Party Island slot game. The scatter payouts associated with the Glitter Ball symbol are attractive. Five such symbols appearing anywhere on the reels offer a scatter payout of 750 coins. This is multiplied by the total bet to convert to credits. Three or more Glitter Ball symbols appearing anywhere on the reels activate the free spins bonus round. This is a standard bonus round that awards 15 free spins at tripled payouts. The free spins can be re-triggered if three or more Glitter Ball symbols appear on the reels while the round is in progress. 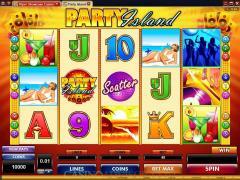 Party Island also offers the Microgaming gamble game. After being awarded any payout players have the option to play this game. They can try to double the payout by guessing the color of the next card or try to quadruple the payout by guessing the suit of the next card. Players can wager on the gamble game till they lose or till they reach the limit. They can also collect their winnings anytime they choose to do so. The gamble game does not have any house edge. Interested in reading more detailed information about Party Island? If so Click Here for more details.